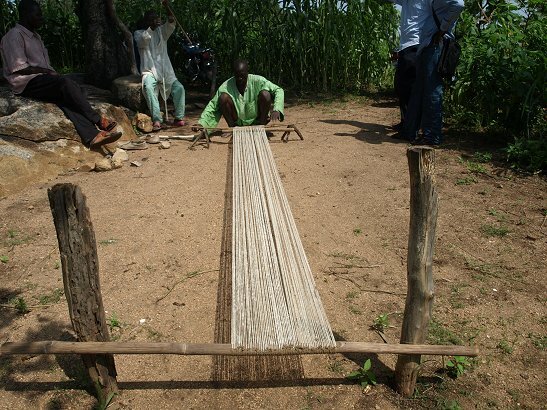 Weaving cloth goes far back in the story of humanity, 10,000 or 12,000 years, probably to a time when someone first discovered that grasses and supple plant fibers could be interlocked to form something like a mat. It is the act of interlocking two separate strands that comprises weaving but plant fibers are generally short and to make something larger required learning how to make long strands of something. 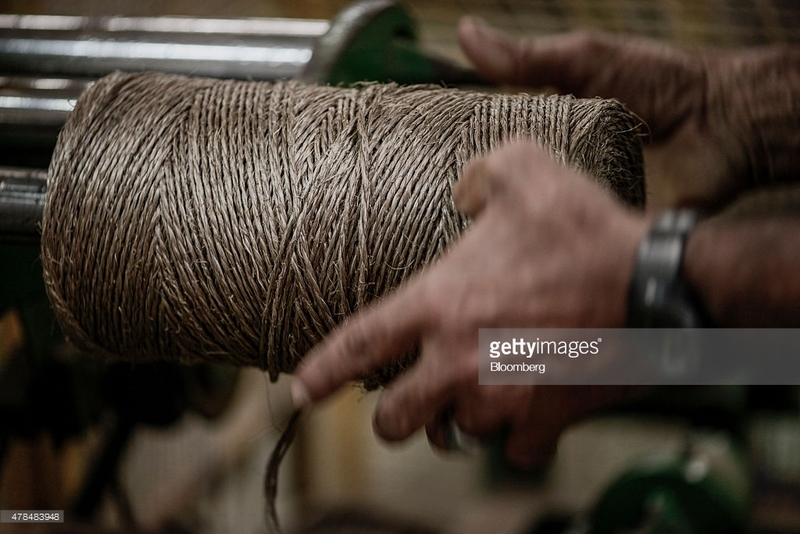 It is shrouded in mystery how people first began twisting longish plant fibers such as Sisal to form string and somehow that led to the twisting of cotton and wool to form what we know as yarn. 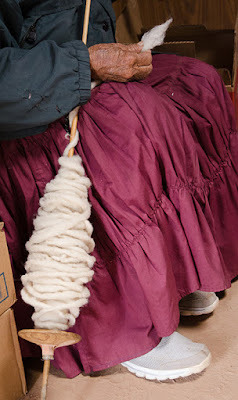 The Diné however know exactly how they learned to spin and then to weave. The Book of the Navajo; 1976, Raymond Friday Locke. After the medicine woman told the people about the prayersticks she told them that there was a place in the underworld where two rivers crossed. It was called ni tqin'kae tsosi, fine fiber cotton (Indian hemp). There were two persons who brought the seed of that plant, they were spiders. They said that the people were to use the plant instead of skins for their clothing. So this seed was planted in the earth. When the seeds were planted, the plant ripe, and the cotton gathered, the people shaped a little wheel, 3 or 4 inches in diameter, and they put a slender stick through it. This was used in the spinning of cotton. When they began spinning they pushed away from the body toward the knee. Then the chief medicine woman said: "You must spin towards your person, as you wish to have the beautiful goods come to you; do not spin away from you. 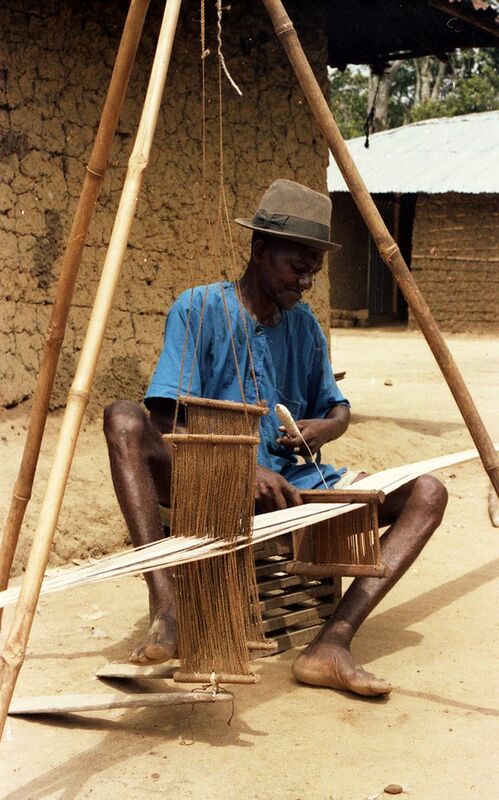 However it started, the practice either spread quickly or was discovered by distinct groups in different places, for weaving is found in both the old and the new world and in Africa and Asia. 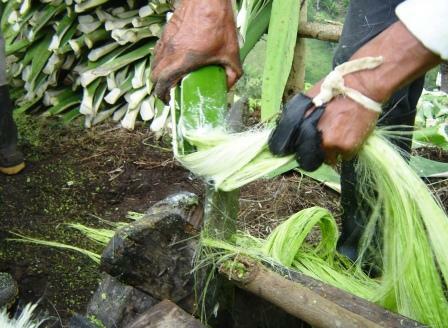 And in every region where weaving was practiced, the methods used were distinct and unique to the region. Regardless of the distinct differences found throughout the world, the process of weaving is essentially the same today as it was 10,000 years ago: the interlocking of yarn that is situated at right angles to one another. The differences that are found are related to how the interlocking is carried out. In English speaking countries the strand of yarn that determine the length and width of the cloth is called the warp and it is static, stationary, and not moving once it is ready for weaving. The yarn that weaves over and under the strands of the warp is called the weft, it interacts with the warp to create the color and the pattern of the finished cloth. This interaction is determined by the creativity and skill of the weaver and at times by the traditions to which the weaver is beholden. 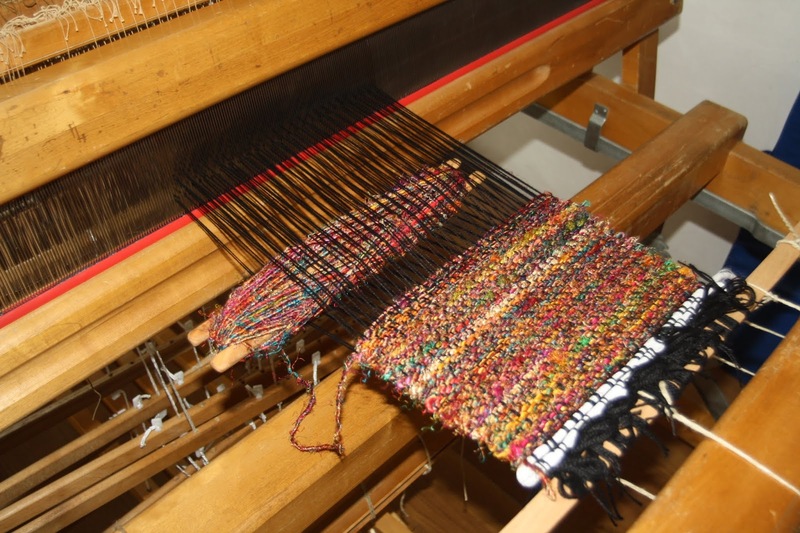 How the individual strands of the weft are made to go over and under the strands of the warp is a characteristic of the weaving traditions inherited by the weaver. 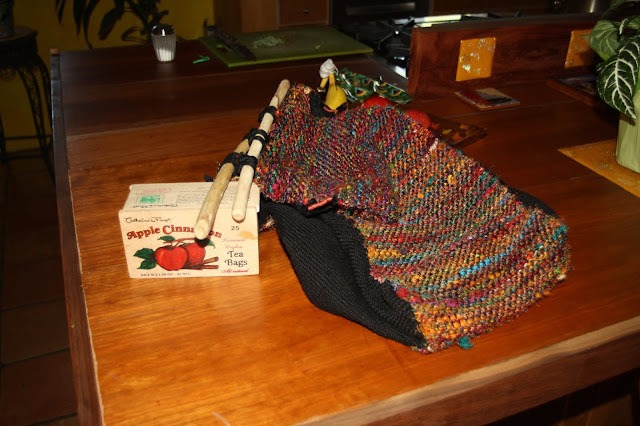 Such traditions can at times be altered by a creative craft person seeking improvements for there is no denying that weaving individual strands is time consuming and tedious. 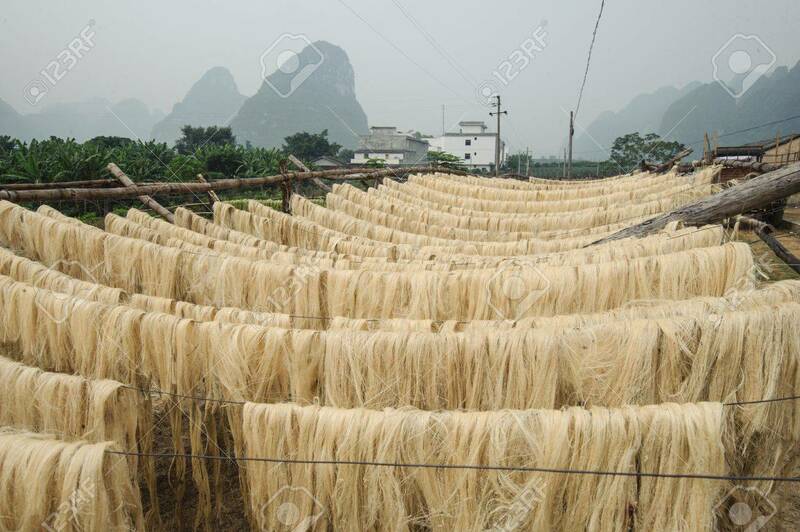 It is therefore likely that the first innovation was to raise a pre-determined number of the warp strands in unison so that a strand of the weft could be put through the opening, called the shed. 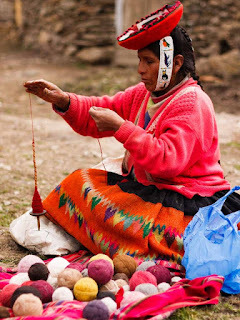 Probably the earliest form of creating a shed was to insert a stick through some or all of the odd number strands of the warp and another for the even numbered strands, a practice still common among the weavers in South America and the Diné that allows them to create intricate designs. It is a characteristic of people to want to work better and or more efficiently and this has been true of weavers who at some point began creating machines or looms that made this possible. 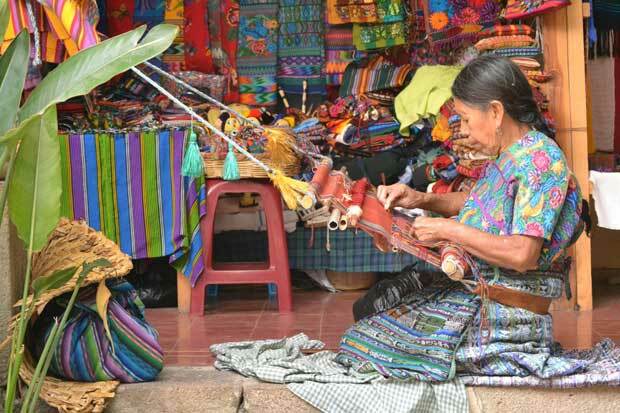 Some of these looms are very basic such as the back strap loom from South America or looms from Africa and Asia. 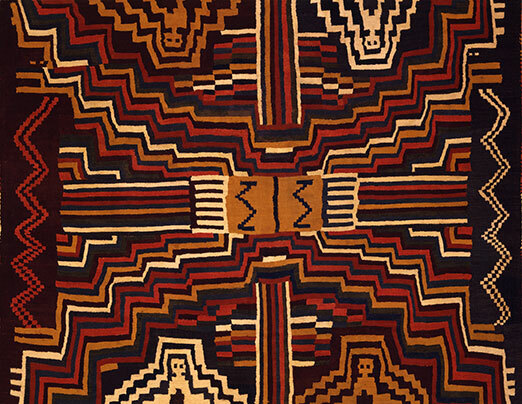 Europeans began adding more complexity to their looms, making it possible for their designs to be more intricate. 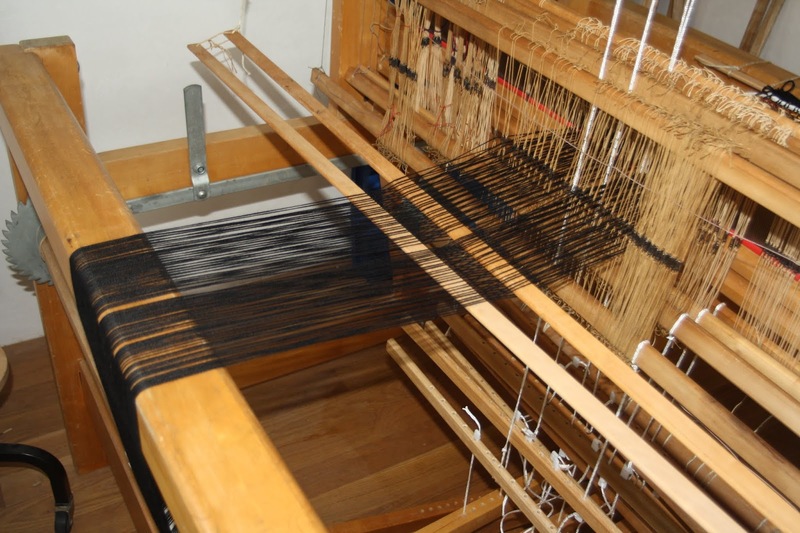 This was accomplished by passing each strand of the warp through a loop of string or wire called a heddle that was fitted onto a frame called a shaft or a harness. The European loom could have as many as 12 shafts that could be raised by a series of foot treadles. 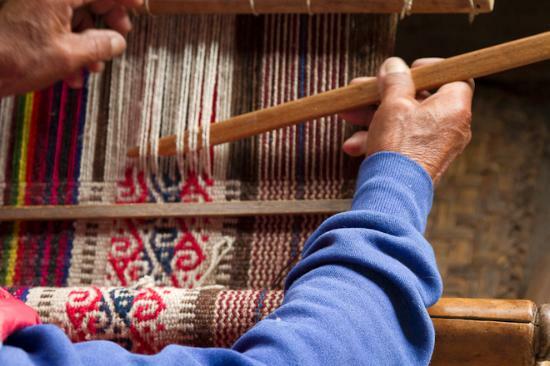 Hand weaving unaided by mechanical devices was naturally the first type of weaving that was employed and is still to be found in various parts of the world. However despite being the first and most basic does not relegate it to being the least complex, nor the least beautiful in color and design. Sihuas Culture-abstract rayed diety 500 B.C. 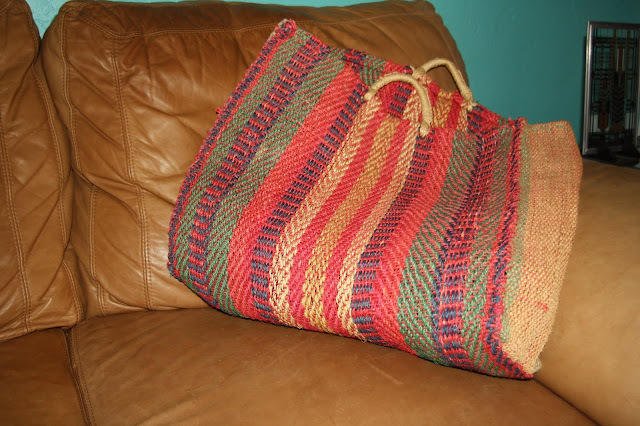 I started weaving as a hobby off and on some forty plus years ago and I can’t say that I’m expert in the art as those weavers who have made it their life work. Still I find that it is both a relaxing and enjoyable way to create. Last year I upgraded to a bigger loom that I bought used from a woman that bought it from Finland when she lived in Germany. And recently I took a class at the local community college in order to learn some of what I had, as a self learner, stumbled upon.